Ricardo Vargas M |Sociologist with an M.Sc. and a Ph.D. of the Universidad Nacional de Colombia Faculty of Human Sciences. What do the figures of cocaine production that have raised red flags on the situation of narcotrafficking in Colombia mean? How to interpret the measures taken by the administration? Colombia is the country with the greatest cocaine producer potential in the world, passing from 1,053 tons in 2016 to 1,379 in 2017, an increase of 31%. This figure surpasses by far the figure of Peru (410 ton) and Bolivia (275 ton). In other words, the production potential for the Andean region is 2,064 tons, where Colombia has 67% of all the world production of cocaine. According to this information, cocaine is now globalized and there is practically not a place in the world that does not participate in transit or demand for cocaine. Colombia with its 67% production is the epicenter of cocaine trade through five geographic spaces: The Pacific, Venezuela, Ecuador, the Amazon, and the Caribbean. The transnational confiscations (chart No. 2) are good clues on the dynamics of the global markets, and in this point South America is the most active space with 61% of the confiscations, both due to the importance of Brazil as an exit point toward Europe via Africa– as well as the increase in demand of the southern cone (see table 2). The world cocaine demand percentage during last year was 0.4 %. For America, use percentage was 1.6 %, while in South America the average reaches 1.5%. Table 2 shows the percentages by country. According to Table 2, the four countries which lead consumption in South America currently have difficult hospitalary emergencies, due to consumption issues. Colombia still has no consumption issues at its demand is half of the South American average and way below Uruguay, Brazil and Chile. Despite that the price of a gram of cocaine is the lowest in South America. However, Colombian authorities are saying there is an exaggerated demand increase due to a supposed oversupply due to the increased amount of confiscations in Colombia (435 ton in 2017). 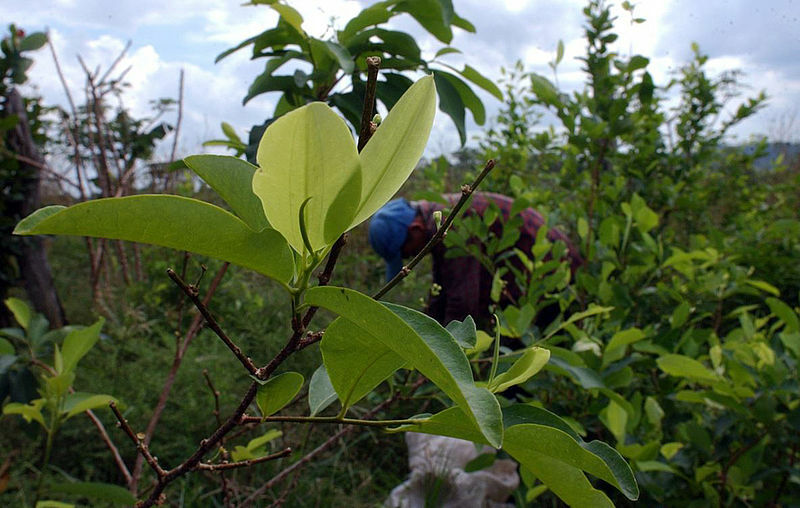 Colombia continues to be the first supplier (90%) of the cocaine distributed to the United States, the rest comes from Peru, and still the refining technology discovered suggests that it is handled with Colombian procedures, which could imply the basic cocaine paste (BCP) is being brought from Peru or that Colombians are controlling Peruvian laboratories . 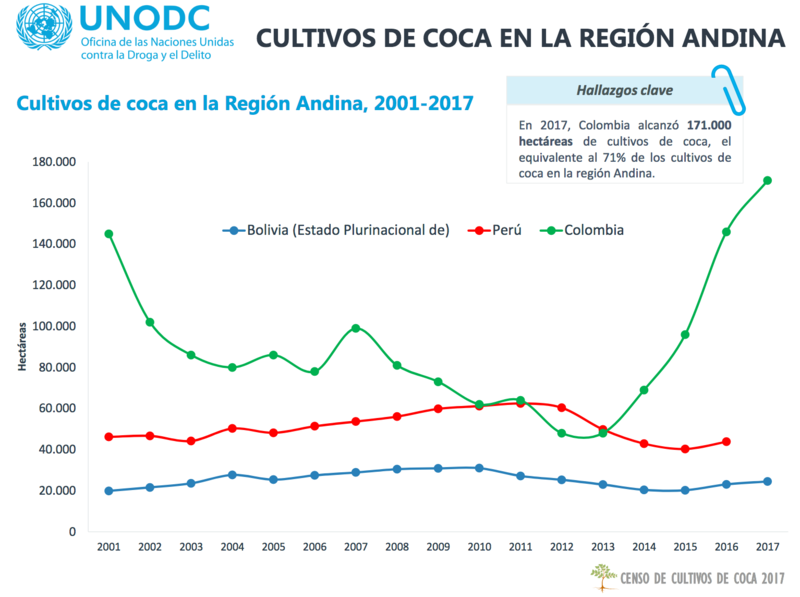 But also with the increase in cocaine cropping in Colombia since 2015, it seems Colombian is emerging again as the largest coca provider to Europe. This year reports speak of a 67% increase of cocaine exports to Europe . The reports of seized drugs coming from Colombia (80% of the total) increased in such a manner that reports coming from Venezuela (12%) and Ecuador (12%) involve Colombia as the country of origin . In this context, the great question is the type of connection between Colombian and Brazilian narcotraffikers, as Brazil is the main point of cocaine exports to the world. In fact, Brazil receives packages coming from Peru and Bolivia and the amounts sent from Colombia are unknown. In contrast to the prior, the distorted information of the Colombia issue with cocaine produces confusion and weaknesses when it comes to taking reasonable strategies or at least more realist. This information creates fear in the public opinion creating imaginary epidemic situations of the internal demand, while little is done in prevention and treatment. On the other hand, there is the conceited idea that the Mexican Cartels are the absolute owners of the world cocaine trade, managing armed groups, controlling internal business spaces in Colombia, creating a false wall in regards to Colombian transnational structures that move surreptitiously like fish in water connecting structures in the world cocaine scenario. Also, they are concealing the links that guarantee money laundering including land in Colombia and the relationships with legal environments which feed on narcotrafficking money and end up erasing the frontier between lawfulness and illegality. In the world cocaine scene, Colombia has recovered an exponential increase, managing almost 70% of the world offer. Only the United States represents a third of the global cocaine demand, putting into context the importance of Europe and South America on the matter, contrasting with the weak protagonism in the international order. Toward inside Colombia, this transnational scale distorted by stories that place the issue in a supposed exponential scaling of the internal demand, in regards to the discontinuing of the cocaine flow due to the increment of confiscations. The main measure of the government and the Prosecutors Office are moving in this direction, meaning they ignore the main part of the problem and take populist punitive measures for users and producers, and the growing pressure to spray glyphosate again to solve the problem. Ignoring the history of more than 40 years of failures using this herbicide, with the negative consequences to health, the environment and socially, which sustain the principle of precaution argued by the Council of State in 2013 and 2014 . The imaginaries that they have been creating on the oversupply of cocaine for the internal market has helped to justify measures as confiscation with blind direction, such as seizing amounts prevised by the law as personal dosage, impacting a reasonable sentence of the Constitutional Court over provisioning dosage, imposing an absolute rating which hinders perceiving complex scenarios which accompany the use of drugs, above all those considered problematic. [1UNODC Colombia, Monitoreo de territorios afectados por cultivos ilícitos 2017. Resumen Ejecutivo, septiembre 2018. UNODC World Drugs Report 2017. The cocaine market. page 29. UNODC World Drugs Report 2017. The cocaine market, page 31. State Council Ruling of December of 2013 and February 2014. This entry was posted in Illegal economy and organised crime, Latin America, mafia, Narcotraffic and tagged Colombia, Red Alas. Bookmark the permalink.